Immunoblot of H23 cells treated with trametinib (25 nM), SCH772984 (500 nM), or their combination for the times shown. DEL-22379 is a water-soluble ERK dimerization inhibitor with IC50 of ∼0.5 μM. MK-8353 (SCH900353) is an orally bioavailable, selective, and potent ERK inhibitor that inhibits activated ERK1 and ERK2 in vitro, with IC50 values of 23.0 nM and 8.8 nM, respectively (IMAP kinase assay), and nonactivated ERK2, with an IC50 of 0.5 nM (MEK1-ERK2-coupled assay). AZD0364 is a pre-clinical ERK1/2 inhibitor with an IC50 of 0.6 nM for ERK2. CC-90003 is an irreversible inhibitor of ERK1/2 with IC50s in the 10-20 nM range and shows good kinase selectivity in a 258-kinase biochemical assay. Corynoxeine, which could be isolated from Uncaria rhynchophylla, is a useful and prospective compound in the prevention and treatment for vascular diseases. It is a potent ERK1/2 inhibitor of key PDGF-BB-induced VSMC proliferation. Magnolin is a natural compound abundantly found in Magnolia flos targeting ERK1 (IC50=87 nM) and ERK2 (IC50=16.5 nM) and inhibits cell transformation induced by tumor promoters such as epidermal growth factor (EGF). ERK5-IN-1 is a potent, and selective ERK5 inhibitor with IC50 of 162 nM. The effect of ERK5-IN-1 on botrocetin/VWF-induced human platelet two-wave aggregation. Representative images (20x magnification, scale bar 100 μm) of tumor histology (H&E and trichrome staining) and IHC staining for DNA double strand breaks (DSBs, γH2AX staining) from control and Hsp90i+Erk5i treated mice on day 13. LY3214996 is a selective and novel ERK1/2 inhibitor with IC50 of 5 nM for both enzymes in biochemical assays. 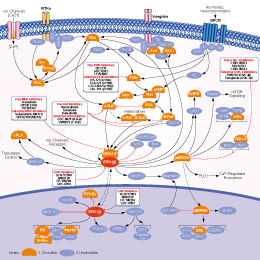 It potently inhibits cellular phospho-RSK1 in BRAF and RAS mutant cancer cell lines. Pluripotin (SC1) is a dual inhibitor of extracellular signal-regulated kinase 1 (ERK1, MAPK3) and RasGAP with Kd values of 98 nM and 212 nM respectively. It maintains embryonic stem cell (ESC) self-renewal. Ulixertinib (BVD-523, VRT752271) is a potent and reversible ERK1/ERK2 inhibitor with IC50 of <0.3 nM for ERK2. Phase 1. Immunoblotting studies depicting BTK, PLCγ2, ERK1/2, and p90RSK signaling in nontransduced, vector only, BTKWT, or BTKCys481Ser (BTKC481S) MYD88-mutated WM (BCWM.1) and ABC DLBCL (TMD8) cells following treatment with vehicle control, ibrutinib, or ERK1/2 inhibitors (ulixerinib, GDC-0994) alone or with ibrutinib for 2 hours. GAPDH was used as protein loading control. FR 180204 is an ATP-competitive, selective ERK inhibitor with Ki of 0.31 μM and 0.14 μM for ERK1 And ERK2, respectively. It is 30-fold less potent against the related kinase p38α and failed to inhibit any kinases(MEK1, MKK4, IKKα, PKCα, Src, Syc, and PDGFα) at less than 30 μM. ERK1/2 inhibition reverse EMT in H1299- EML4-ALK cells. H1299-EML4-ALK cells were treated with FR180204 (10 μM), crizotinib (10 nM) and S3I-201(20 μM) for 24 h, cell extracts were analyzed by immunoblotting. Immunoblotting studies depicting BTK, PLCγ2, ERK1/2, and p90RSK signaling in nontransduced, vector only, BTKWT, or BTKCys481Ser (BTKC481S) MYD88-mutated WM (BCWM.1) and ABC DLBCL (TMD8) cells following treatment with vehicle control, ibrutinib, or ERK1/2 inhibitors (GDC-0994) alone or with ibrutinib for 2 hours. GAPDH was used as protein loading control.